I was already extremely happy with the Sixaxis controller, but I could not resist getting the DualShock 3. Not only do you get the rumble, but also, it feels much better in your hands, even for those games that do not use this feature. The rumble function is fun, but on top of that, it helps with gameplay, because “feeling” what is happening provides a lot more feedback than just watching how your character or car reacts to the environment. The biggest surprise of all was that the rumble works with PS 2 games in the PS 3 system. I am currently playing through “God of War”, a game which had the rumble capability in PS 2. I thought that it was unlikely that I was going to get this feature with this new controller in the PS 3, but it worked perfectly. I know that having to buy a new controller and basically discard the one that came with the system is not the ideal situation, but I have to say this product is really worth shedding the extra bucks. Well folks, now that the dust has settled from the Sony vs. Immersion lawsuit, Playstation 3 owners are finally able to feel the vibe again! I purchased this controller today and I knew the only way to properly road-test it was on the game that made the Dualshock famous, Metal Gear Solid. After booting up the game, I walked down the hallway and got spotted by a guard. As he shouted, “WHO’S THAT?” the controller jumped in my hand – and I knew this was a smart purchase. As the guards shot at me, I felt the feedback of the bullets, just as I had 10 years ago on my Sony Playstation. I picked out another old school Playstation game, Tenchu: Stealth Assassins. From Ayame’s blades to Rikimaru’s sword, each sword swipe and jump had excellent feedback. Okay, so my Playstation games worked out. But what about my Playstation 2 library? I popped in God of War, knowing I had to feel the swing of the Blades of Chaos. The controller vibrations felt a little lighter here, but the vibrations still occurred at the appropriate times. Then I chose Incredible Hulk Ultimate Destruction. Who better to test a vibration controller than the Sultan of Smash? All the power jumps and smashes had the vibrations intact, but they still felt a little on the light side. All right, so far I was two for two with my Playstation and Playstation 2 test subjects. But what about my Playstation 3 games? Could I possibly hit a trifecta? I put in Uncharted: Drake’s Fortune and I decided to jump right into a heated firefight. The controller gave me feedback while shooting weapons and getting hit by enemy fire, but I knew my purchase was justified when Drake was near death: I FELT THE DUALSHOCK 3 PULSING IN SYNCH WITH DRAKE’S HEARTBEAT. It’s one thing to hear that noise and know he’s near death, it’s quite another to feel the pulse in my own hands. Okay, so the feedback on the older games was there, but a little lighter than I remember. The reason? Well, when I decided to go wireless on my Playstation 2 system, I bought a Logitec Dualshock controller. It turns out, that controller takes two “AA” batteries, and the vibration motors inside the controller handles are slightly larger than the ones in the Dualshock 3. That’s where I felt the difference. The Dualshock 3 vibrations may be slightly less than the Logitec controller, but it doesn’t require the purchase of batteries. The Dualshock 3 may be slightly heavier than the SixAxis, but it doesn’t take up any extra space at all. Sure, the price is about $15 more than the SixAxis, but it’s a worthy upgrade for the Playstation 3 gamer who kicks it old school as well as new school. The only other drawback is the lack of an additional USB cable – but we can use the one that came with the system itself. Order it, plug it in, charge it up, and get ready for the inevitable downloads from the Playstation Store to make the older PS3 games Dualshock 3 compatible. 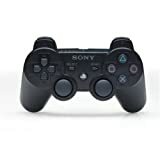 The Playstation 2’s highly regarded DualShock 2 controller was considered by many to be the best videogame controller of all time. So when you’ve got a winning design there’s no need to change anything. However, because of a legal battle with Immersion over rumble technology, Sony was forced to offer their Sixaxis controller without rumble. The Sixaxis had the same Dualshock design but it felt too lightweight and cheap. Thankfully the lawsuit has been settled and rumble has come back to the Playstation. For the most part, the DualShock 3 is almost identical to its PS2 precessor. But it has all the features of the original Sixaxis controller in addition to rumble. The controller is still wireless, can be charged by plugging it into your PS3 (or PC), rumble is compatible with all PS1 and PS2 games, and the PS3 supports up to 7 controllers at the same time via bluetooth. Rumble in the DualShock 3 seems more responsive in regards to the location of its vibration depending on which side you get hit on during the games. I don’t know if this is something in the design or if it’s the developers doing it for the games but I welcome it. All in all this is currently the best designed controller on the market right now. The PS2’s DS2 was incredible so “if it ain’t broke, don’t fix it” applies here. I’ll be enjoying rumble in my PS3 games from now on. For the past year and a half something has been missing. You don’t know what it is but theirs a void and somehow you want to fill it if only you could figure out what it is. You’ve played Resistance, Warhawk, Heavenly Sword, and Uncharted but something doesn’t feel the same. Well worry no more your fears can now be relieved. Rumble is back to bring many of the PS3 best games to life. Granted we shouldn’t have had to wait for this controller and its been a painful wait for Sony to settle the lawsuit and get the dualshock 3 into our gamer hands. But at least now its here and without it your truly missing out on that last bit of immersion games have been giving us for many years now. Its not a new feature, of course, but its a necessary one. As a PS3 owner I’ve missed it and I’ve taken issue with Sony leaving it out of the sixaxis. No we can have our rumble and feel it too. The controller has a great weighty feel to it. Still includes the motion sensing of the original sixaxis controller. The rumble works on all of the best games, except for Call of Duty 4 but I’m sure a patch will be available in the future. You really can’t ask for more. Its rechargable without the need to buy anything extra. Consider all the batteries you don’t have to buy and it pays for itself. Honestly, words cannot say how much more I love this controller compared to the Sixaxis wireless controller for the PS3. I actually got my DualShock 3 imported from Japan back in February and have used it all the time on my PS3. I have only played with the Dual Shock for PS2 and PS1 games though and not PS3 games yet since I only have 2 games that do not support rumble for the system. I can say that the Rumbling feature is 100% the same as the Dual Shock 2 for the PS2! First off, the weight difference is significant compared to the Sixaxis. You can tell no doubt which controller is which once you pick up both a Sixaxis and Dual Shock 3. Second, they now have 3 different colors for the controller which is pretty sweet cause now you can buy the controller in Silver, Black, and White. Now, to review on the rumbling itself, well, IT’S AWESOME!!! It’s 100% accurate once something happens in a game where the controller is supposed to rumble and it gives you that feeling of awesomeness when playing games that have the rumble feature. The ONLY con I have to say about this controller is that sometimes it can drain the battery a bit quickly, but hey, I would take this controller 100 times as much compared to the Sixaxis. Overall, no doubt this product deserves 100 stars, but I can only give it 5.